Nearly 12 years ago, Jill Finley and her sisters started their annual family quilt retreat. From the humble beginnings of just eight quilters, “Family Pieces” has grown to a group of 38…sisters, mothers, daughters, aunts, cousins, and QUILTERS, all dedicated to passing on the cherished tradition of quilting. But they’ll tell you, it’s not just about quilting. They found a way to build relationships based on a common goal…a family thread. Stitched Together is packed with fun and creative ways to quilt together. There are projects for every skill level, designed for a wide range of group activities…like Fabric Exchange, Block Exchange and Team Work. 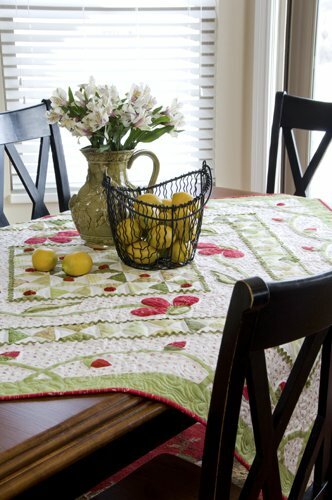 “Wildflower Melody” is a gorgeous quilt that’s perfect for Team Work. (And a great block-of-the-month pattern too.) For a Block Exchange project, choose “Carousel,” “Dressed to the Nines” or the spectacular "Garden Rows" quilt. Just For Fun, we have the delightful pincushions “Fresh Baked” and “Fresh Squeezed”…projects that give everyone something they can easily finish and take home. And there’s also a nifty reversible apron called “Sunny-Side Up” to wear when you whip up those special family recipes, like Mom’s Soft and Sweet Orange Rolls or Tori’s All Together Now Salad. Join Jill at her family retreat, and take part in the time honored tradition of group quilting.